Jenn Vozzo didn't expect to get rushed to the emergency room after a quick visit to the bathroom. Four years ago, Vozzo, then 24, hadn't been feeling well, so she went into the bathroom to splash water on her face. The next thing she knew, she was kneeling on the floor, her head gushing with blood all over the white tile. Vozzo had fainted, slamming her head into the bathroom vanity on the way down. She stood up, stared into the mirror and saw a five-inch gash at the top her head. One look at the injury and her family insisted that she go to the emergency room, where she received six staples on her forehead. "Boy, did it hurt," said Vozzo, of Branford, Ct. "I…had to have a tetanus shot and was put on antibiotics for a week. Two weeks went by, and I had to go back to the hospital to have the staples removed. To this day, however, I have a visible scar about 2.5 inches long from my forehead back." While the experience was scarring—literally—for Vozzo, a new report shows that bathroom injuries are not all that uncommon. A new study from the Centers for Disease Control and Prevention found that approximately 234,000 people ages 15 and older were treated in an American emergency department for non-fatal bathroom-related injuries in 2008. That averages to about 640 people per day. "What was interesting in this study was that even though the injury rates were lower in younger people, people of all ages fell in the shower or tub," said Judy Stevens, lead author of the study and a national epidemiological expert on older adult falls and fall prevention. "This supports the recommendation of having grab bars installed inside and outside the tub and shower." 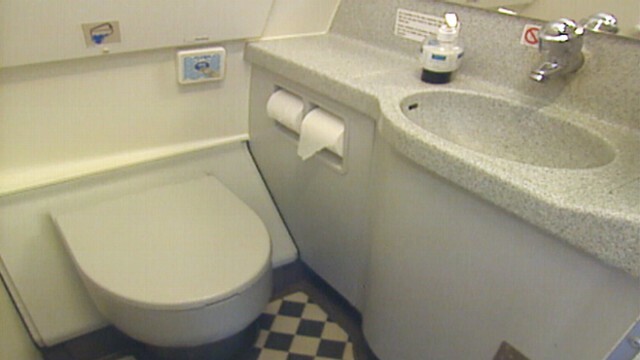 Experts said the bathroom can pose dangers because of its wet, hard surfaces; how a person is often rushing to get to the bathroom; and the heat, which can dilate peripheral veins and lower blood pressure, causing dizziness in some people. More than 80 percent of bathroom-related injuries were caused by slips and falls, mostly while getting in and out of the tub or shower, and about 30 percent of those injuries included cuts, scrapes and bruises. Injury rates were more common in women and older patients. Younger people were more likely to be hurt in or around the tub, while older people sustained more injuries on or near the toilet. Many retirees cannot afford bathroom renovations to install grab bars and other bathroom safety features, noted Dr. Carl Ramsay, chairman of the department of emergency medicine at Lenox Hill Hospital in New York City. "So they live with the same wet floors; slippery, high-walled bathtubs-showers; and no handrails -- despite having a tendency to have an increasingly unsteady gait, relatively weaker muscles and bones," said Ramsay. "In addition, they are frequently on medications that control their heart rate, thus blunting their bodies' natural responses to a change of positions from sitting to standing." Ramsay said the medication can lead to lightheadedness and sometimes loss of consciousness after using the toilet. But Dr. Jeffrey Suchard, professor of clinical emergency medicine at University of California, Irvine Medical Center, noted that the study does not compare bathroom-related injuries with those occurring in other locations or rooms, so one cannot conclude that the bathroom is particularly dangerous. While it could be, Suchard said there's no reason to fear the bathroom. "[The study's] estimate of the number of injuries represents only about 1 percent of all non-fatal injuries that occur," said Suchard. "To me, that is actually a surprisingly low percentage of all non-fatal injuries, considering how much time people spend in bathrooms compared to other locations, the frequent wet bathroom surfaces making falls more likely, and equipment that might injure you if you came into contact with it." But low percentage or not, Stevens said that bathroom grab bars are a good recommendation for people of all ages. "It's important because people think of grab bars as, 'Oh, I only need them when I'm old,' but everyone can benefit from them," said Stevens. "It's the sort of thing that you don't have to use, but they're there if you need them. And of course, nonslip surfaces and bathmats are important, and that seems to be something that has already been adopted by many."